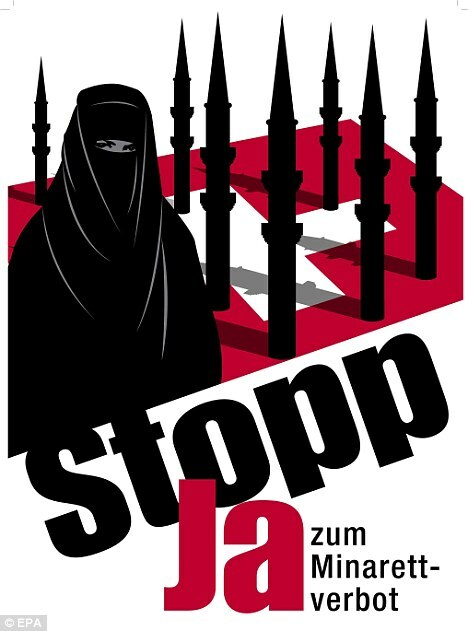 The recent ban on the construction of minarets (tall spires commonly found on Islamic mosques) in Switzerland is simply the latest move in a laundry list of actions taken by European countries to staunch the tide of growing visibility of Islam in what the far-right consider to be Christian lands. (The fact that Jews have also lived in these countries for centuries and that France, home to the nationalist group the National Front, boasts the largest Jewish population in Europe appears to be meaningless). Far-right groups, and their followers, view the current struggle to be potent examples of a larger clash of religions. In their view, Islam is incompatible with Christian practices and traditions. (Substitute Judaism for Islam and you could be back in 19th century. ) What is conveniently ignored is that few West Europeans see themselves as practicing Christians. What Muslim immigrants represent to many, therefore, is not so much a threat to Christian practice, but rather a threat to a finely honed secularism that reigns supreme throughout Western Europe. But the issue of the minarets goes beyond the religious/secular divide. It speaks to a bigger problem: fear of change, the type of fear that feeds off of dramatic shifts in cultural touchstones, in traditions, and in societal mores. Europe must face its current reality. It is home to a large Muslim population, many of whom were welcomed with open arms as guest workers in the 1960s and 70s. These guest workers, together with their families, have now been citizens of countries like France, the Netherlands, and Switzerland (all of whom have political parties who support the minaret ban) for generations but yet are still treated like outsiders. France’s Muslim community has been living and working in mainland France since the early 20th century and many still feel disenfranchised from French society. In fact, according to a recent article in Le Monde, one out of every two young men (many of whom are second or third generation French Muslims) live in poverty. Even those who have managed to become successful, such as Le Monde journalist Mustapha Kessous, face ongoing discrimination from peers and colleagues. The Dutch welcomed waves of guest workers from Morocco and Turkey in the post-war years. And yet, even after family reunification laws were put in place guaranteeing that Muslim immigrants would stay, the Dutch made little effort to understand their traditions while insisting that the Muslim community instantly conform to Dutch culture and belief systems. The Swiss meanwhile, not the picture of tolerance some would make it out to be, have refused citizenship to immigrants living in Switzerland for several generations. When are Europeans going to realize that the people they consider to be outsiders are really insiders? Their skin color may be different, they may practice a different religion, but the majority speak the native language, contribute to the work force, and are good citizens in their adopted countries—and have been so for quite some time. What most of them ask for in return is appropriate respect for their traditions, the ability to practice their religion openly, and to be accepted on equal footing. Europe does not have a good track record when it comes to embracing those they view as strangers. One need only to look to the Holocaust for confirmation. To atone for the sins of the Shoah, many European countries, including France and the Netherlands, have erected monuments, museums, and required Holocaust education in junior high and high schools. But that’s easy compared to confronting the difficult task of integrating a growing minority that has been pushed to the fringes for so long. The past 60 years has been an experiment in tolerance and multiculturalism. To use the violent actions of a small fundamentalist minority as an excuse to engage in xenophobic rhetoric and action—as those who support the minaret ban did—suggests that perhaps this experiment may not be based on such a strong foundation as one may have thought. It is not enough anymore to judge Europe on how it confronts its past. It must also be judged on how it treats its present. Is it up to the challenge? If Islam is to persist, it too must be reformed. It’s pages with teachings of hate, intolerance and violence against non-Muslims, describing Jews and Christians as monkeys and pigs, has to be ripped from the Qur’an. The messages printed on the pages of the Qur’an provides the basis for its spiritual leadership – its imams – to preach, condone, encourage, applaud, cultivate, foment, espouse or otherwise embrace hatred toward non-Muslims, reducing Jews and Christians to “kafirs” worthy of killing. Not only does the Qur’an teach intolerance toward the beliefs of non-Muslims, it justifies killings of any Muslim who leaves Islam wishing to convert to another religion. It teaches that beheading and maiming as a valid form of punishment. There is a glaring difference between the followers of the Bible and of the Qur’an. In modern-day Christianity, there isn’t an organized and devout group of followers of the Bible who are reading a consistent message of hate. Christian leadership does not teach look upon non-Christians with disdain and to act violently against them while shouting “Praise Jesus”. Christians do not seek the support of preachers, fathers, bishops or fellow parishioners to justify planned acts of violence against non-believers of Christianity. The Qur’an is fundamentally flawed. The teachings in the Qur’an run counter to the teachings of Jesus in the New Testament. Islam’s teachings must change to reflect the beliefs and values of a modern world. Until it does, this outdated version of the Qur’an and its brand of hate-filled Islam has no place in this world and Muslims should expect more countries to resist. These teachings by imams intended for Muslims must stop. Only then will the Muslims, Islam and the Qur’an get the respect it seeks. Why doesn’t Europe just bend over, permit Islam to run rampant, allow its citizens to be converted or executed, dispense with civil law, and adopt Sharia law? There is a HUGE difference between banning the construction of minarets and ensuring that practitioners of Islam do not become Fifth Columns and discriminating against religious observance. The clash of civilizations pits Western culture against a radicalized Islamic populace that seeks global hegemony. Countering that effort, as this minaret ban does, is neither xenophobic nor wrong. Period. Although a large population of Americans may share your view and therefore fall victim to Obamaian naivete, Europe need not similarly succumb. Perhaps the lessons in tolerance about which you speak should be directed toward radical Islam practitioners, whose expansionist conduct precipitated this whole dispute, is in order. But you conveniently ignore that element in your commentary. I’d like to know what the Middle East’s immigration records look like. I’d like to see how they treat those who do not follow Islam. Two West Bank churches were set afire early Sunday as a wave of Muslim anger over comments by Pope Benedict XVI construed as anti-Islam grew throughout the Palestinian areas. This is the tolerance of Islam and its followers. Imagine the outcry if a Mosque in the U.K. were to be treated with the same respect this church got. Muslims would be protesting with more violence. And what was the Pope guilty of? Have you ever noticed that whenever Islamic fascists protest a movie, a cartoon, a story in the press or a social event in a given country which attempts to illuminate how the Qur’an advocates, encourages and blesses violence and murder of non-believers or transgressors against Islam, the radical Muslim resorts to violence, death threats, murder, bombings, beheading, etc., in the name of Islam as a way of protest? Whenever Muslims do this they are reinforcing the very point of the story, cartoon, movie, etc. And isn’t it “funny” how we have to apply the term “Moderate Muslim” to define the rest of the Muslims? The term shouldn’t have to exist in the first place. It’s time for Muslims to look inward for the cause. It’s time for imams who choose to remain silent about the hateful imams preaching violence and intolerance to rise up against them. It is time to rip the pages of hate from the Qur’an and to reform it into the peaceful and loving religion it claims to be. Until that happens Islam remains what it is; flawed to its core. Even more disturbing JTA reports that a Swiss politician is calling for a ban on Muslim and Jewish cemeteries. It’s saying to the Swiss they don’t want to be buried among them. So you see who the xenophobic are now. In the end, it’s Switzerland’s right if it feels like it wants to protect it’s culture and to prevent it from being overrun by a foreign set of values. They’ve noticed what has happened to the U.K. and they don’t want it happening to them. There is absolutely nothing wrong with that. If it seems harsh to you, then you are probably not living in Switzerland. I watched the John Daly piece. It trivialized and twisted the issue for a laugh. He would even joke about the holocaust if he thought he could get a laugh as well. You don’t appear to understand the nature of Islam and also trivialize the seriousness. There is a reason why the term Eurabia exists. You should be more concerned about the proper thing. Just watch that imam in the video in the comments above to get a clue about what you should be against.